This delightful Summer Fruit Flan is just the thing to polish off a fantastic family dinner - or a backyard barbecue - or a christening celebration - or even a tupperware party. To be honest, this is exactly the kind of light dessert that will delight at any get together. 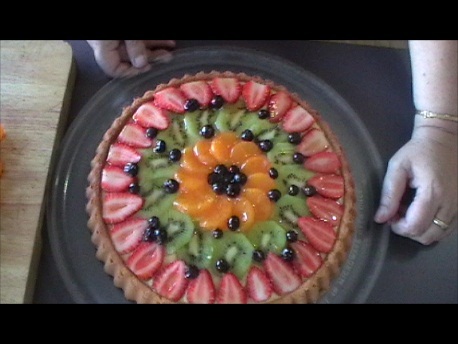 For this recipe, I've topped my Flan with fresh strawberries and kiwi fruit, along with some canned blueberries and mandarin segments - but you can use any fruit you like. Just remember, if you are going to use apple slices or banana - just dip the pieces quickly in either some lemon or lime juice to save them from discolouring. If you have any variations of this Flan that you'd like to share, I'd LOVE for you to submit them in the YOUR recipes section of this site. I have a couple of other Flans that I will be demonstrating on YouTube in the not-too-distant future, so be sure to check back to see if I've managed to get organised - they are Blackforrest Flan and Red Wine Poached Pear Flan. Both of these are very decadent, and will leave you feeling just a little bit naughty. The Flan Pan that I've used is a 12" Flan Plan from Kitchenware Direct, a fantastic online kitchenware store that offers great prices and an extensive range of quality products. If you would like to purchase a Flan Pan like the one I have used, please click here. Any fresh, frozen or canned fruits of your choice. (I've used fresh strawberries and kiwi fruit, and canned mandarin segments and blueberries). Break 3 eggs into a large bowl and beat until frothy. Add the softened butter, sugar and salt. Beat until blended well. Add the baking powder to the flour, and sift these dry ingredients into the egg mixture, then beat until well blended. Gradually add the milk until a light sponge batter is achieved. Pour this mixture into a well-greased 12" Flan Pan, and bake in a preheated 180°C (350°F) oven for 20-25 minutes, or until the Flan Base is golden, and cooked through (test with a toothpick). Allow the Flan Base to cool. The filling consists of a basic custard mix. Place the custard powder and the sugar into a mug, and add about 2/3 cup of milk. Blend these ingredients together until the custard powder and sugar have dissolved into the milk and there are no lumps. Place 400ml milk in a saucepan, and gradually bring to a slow boil. When bubbles appear on the surface, add the mug of custard mix and constantly stir the mixture in the saucepan until it turns into a thick but pourable custard. Remember, as the custard cools, it will thicken. Put to the side to cool. Drain one tin of mandarin segments and retain the juice. To the juice, add one 7gm satchet of gelatine and stir until the gelatine is absorbed into the juice. Put the juice mixture and the jam in a small saucepan and heat on the stove top until melted and well blended. With a pastry brush, coat the inside of the Flan Base with a liberal amount of the jam mixture. This will prevent the custard from seeping through the sponge Flan base, and adds a delicious flavour to the Flan. Pour the cooled custard into the Flan Base until it is almost level with the upper crust ridge. At this stage, place the Flan into the fridge for a few minutes to help the custard to partially set (15 minutes). Meanwhile, prepare the fruit that you want to use for the topping. Then, take the Flan from the fridge and arrange the fruit in an attractive pattern on the top of the custard, pressing in slightly to partially embed the fruit pieces. Take the jam mixture, and using a pastry brush, liberally coat the surface of the fruit. This will act as a glaze and also prevent the fruit from appearing dry prematurely.